22 Barrow Street, Much Wenlock, Shropshire. TF13 6EN. Music has always played a part in services at Holy Trinity and for hundreds of years the church has maintained a strong choral tradition. The choir consists of treble choristers (boys and girls) and senior choristers, some of whom were formerly trebles in the choir. 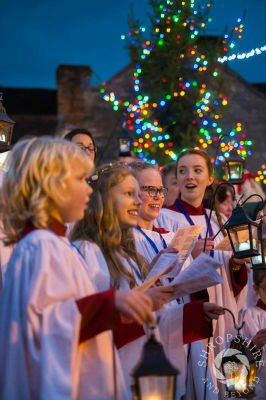 As well as singing for the services of the church, we have also undertaken singing holidays deputising for Cathedral Choirs during their vacations. What benefits are there for a young person joining the choir? Being part of the church means they share in worship, they are encouraged in their faith, they receive pastoral care and can offer their gifts and talents in God's service. In addition today's children need every educational advantage, and singing in choirs helps develop reading, language, concentration, self-discipline, social and team skills. It instils a sense of achievement and offers a free musical education. Few other activities offer youngsters such great educational rewards in return for the amount of time spent in their pursuit. In addition we try to make it great fun! We base our training on that of the Royal School of Church Music (RSCM) which provides instruction and incentive through a series of graded standards. There are also the Dean's and Bishop's Chorister Awards. Most of our teenage choristers in recent years have passed the Bishop's Chorister - RSCM Silver Award. A choir such as Holy Trinity's is one of the only skilled activities in which children and adults participate on equal terms and in maintaining a strong choral element in our services each Sunday we offer opportunities to youngsters not easily found elsewhere in the area. 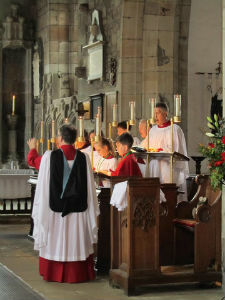 The unique training of a chorister is also recognised by many universities, some of which offer choral scholarships regardless of the course of study pursued. 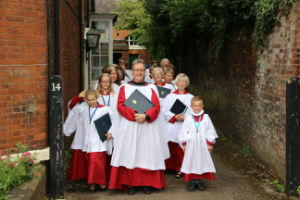 Membership of a church choir is a valuable addition to any young person's CV, highlighting as it does those qualities of commitment, dedication, self-discipline and teamwork which are so sought after in the workplace. Trebles are usually accepted from their 7th birthday and can come from any church background or from none at all. They need not have any previous musical or singing experience. Boys usually sing until their voice changes in their teens after which most stay on to sing in the adult sections of the choir. Girls continue singing Soprano in the senior choir. As well as the educational, social and personal benefits the choir offers there are some tangible rewards to demonstrate our appreciation of the work the Trebles do. Choristers are also paid for singing at Weddings, and receive quarterly choir pay based on attendance. 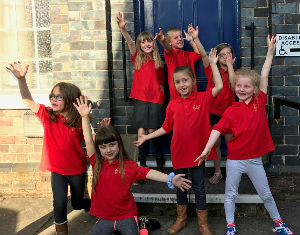 We also offer a singing club for 5 - 8 year olds - Trinity Trebles - this runs on Tuesday evenings 6pm -7pm during term time - there is no regular church commitment, however the children do get the opportunity to sing some of their pieces at family services. Much Wenlock Parish Church follows the Hereford Diocesan Child Protection Policy. Contrary to popular opinion everybody can sing! We have not yet failed to make a youngster into a useful member of the choir - if not into a budding Pavarotti! Brendon joined the choir as a teenage tenor over 30 years ago. After a period as assistant organist he was appointed as Director of Music in 1994. 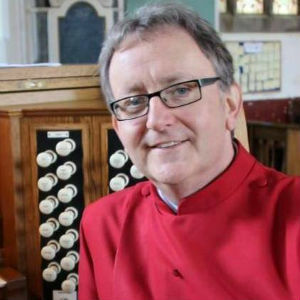 He is a graduate of the University of Birmingham with an honours degree in music, a member of the Guild of Church Musicians and holds the Archbishops' Certificate in Church Music (ACertCM).